Hello and welcome to Day Three of Google CS First Scratch Art. Today, you will create a project in which a famous painting comes to life. To do this, you'll learn about an important computer science concept, Events. In computer science, an event is something that causes an action to happen. An event can be pressing a key on your keyboard, clicking a sprite, or many other things. You've actually used an event before. Last club day, when you made the animation start, by clicking the green flag, you used an event. Artists use events to allow viewers to do more than just look at art. They invite the audience to become a part of it. When people step on the circles in this art piece, for example, they change the colors of the circles. When a hand moves over this canvas, the program generates lines. You react to events too. When your alarm clock rings, you wake up. When your friend calls your name, you look up and pay attention. In today's project, you will create events that make the characters in paintings talk when someone clicks on them. You will use computer science to make well known paintings come to life and help people see art in a whole new way. In this video, you'll learn how to sign in to Scratch and remix a starter project. This video will walk you through the steps, then you'll try them on your own. To start, choose which painting to make interactive. A Kuniyoshi woodcut where the faces can be looked at in any direction. Click the link for the painting you chose to open the starter project. 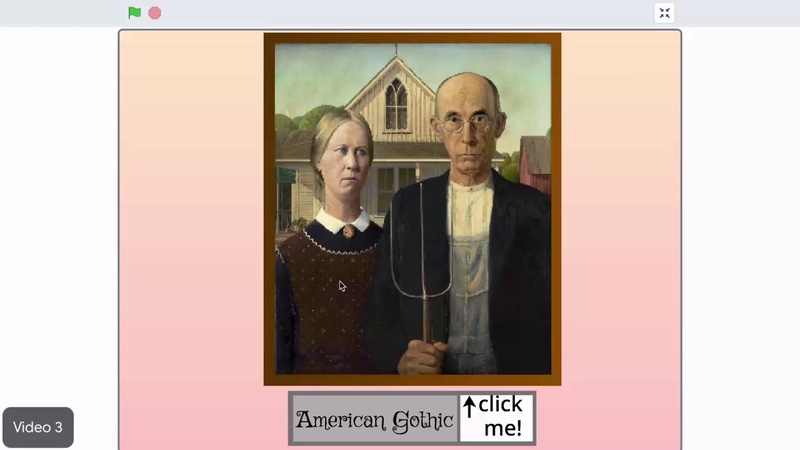 This example will use America Gothic. But you can choose any painting you like. Sign in to Scratch, using the information from your CS First Club Passport. Then click on the Remix button. You have now created a copy of the Starter Project you can work with. Choose a started project to remix then click on the link next to this video to open it. Sign in to Scratch and finally remix the started project. After you finish these three steps, switch back to this CS First tab and click on the green arrow to move on to the next video. Remember, if you have a question, you can always look back in the video or ask a neighbor. Choose a starter project to remix.